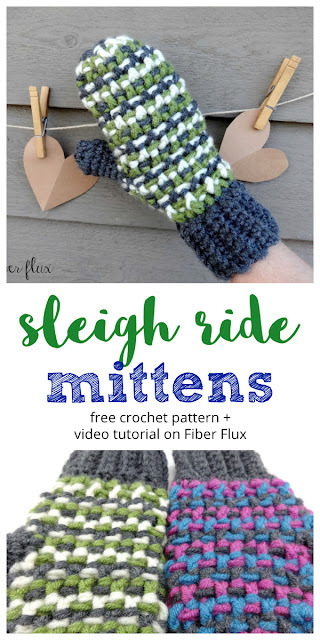 Fiber Flux: Free Crochet Pattern...Sleigh Ride Mittens! Free Crochet Pattern...Sleigh Ride Mittens! The Sleigh Ride Mittens are lofty, colorful and quick to work up. 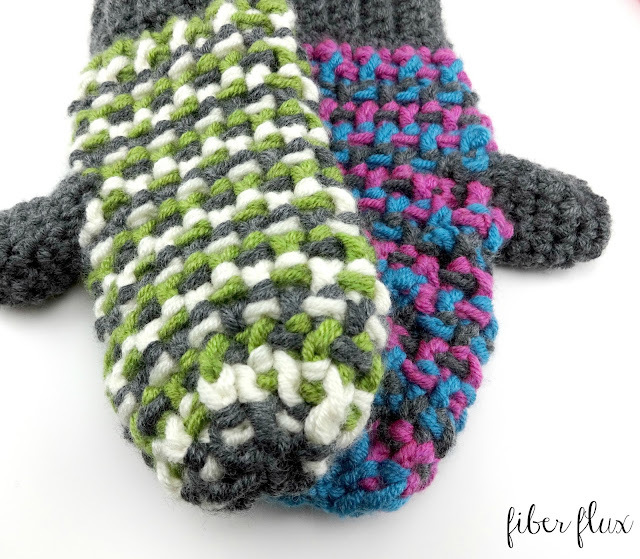 Chunky yarn in fun colors makes these mittens super warm too! The cuff is ribbed and the main part of the mitten is worked up in an all-over colorful woven stitch pattern. Part of the fun is selecting the colors! 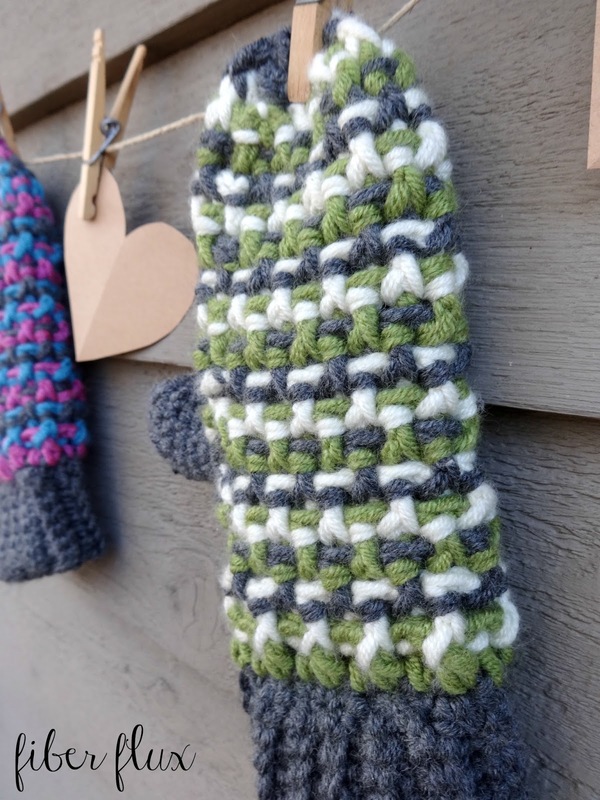 These mittens are part of the Crochet Mitten Drive...make some mittens for a good cause! Extra special thanks to Sonya from Blackstone Designs for organizing this wonderful charity event! 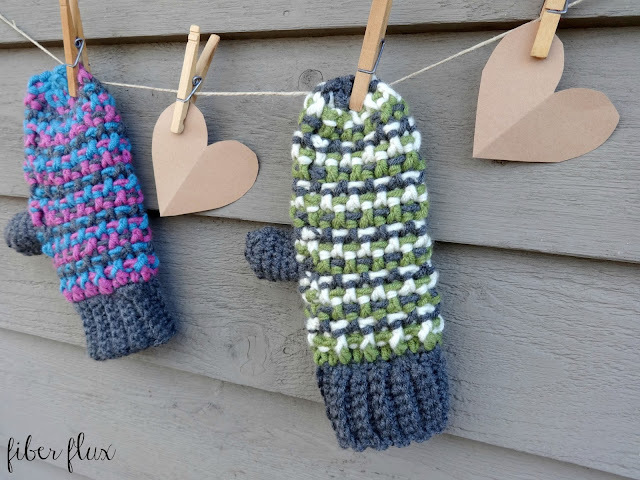 Join our Facebook group here to see all of the wonderful mittens being made for people in need. 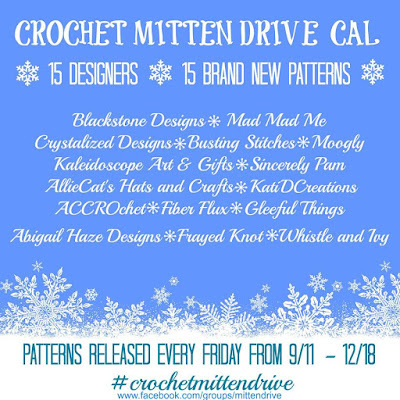 Check out the mittens so far! Note: Cuff and thumb is worked in solid color. Main mitten part worked in one round of each color, then repeated. Cuff is worked as a long rectangle strip, seamed, then rest of mitten is built up from the cuff. Thumb is crocheted on last. Row 1: sc in the second ch from the hook. Work a sc in each ch across. Row 2: ch 1 and turn. Work a sc in the back loops only (blo) in each st.
Repeat row two until rectangle measures 8 inches from beginning. Without fastening off, sandwich the two edges together and work a sl st seam across. Fasten off. Along the top edge of the cuff, work a sc in each st (or hole). Be sure there are 18 sc around the edge of cuff. 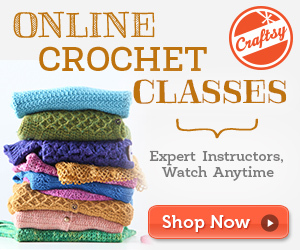 You may have to double up in a stitch or two to get an accurate count. Working this round in same color as cuff makes it look a little neater but not necessary. Round 1: Ch 3, work a dc in the same st. Work 2 dc in the next st. Work 2 dc in the next st. Work a dc in each of the remaining sts. Join with a sl st to close rd. Round 2: Ch 3 (positioning your hook as if to fpdc to keep the "woven" look consistent) *bpdc in the next st, fpdc in the next st. Rpt from * to end of rd. Join with a sl st to close rd. Round 3: Ch 3 (positioning your hook as if to bpdc to keep the "woven" look consistent) *fpdc in the next st, bpdc in the next st. Rpt from * to end of rd. Join with a sl st to close rd. Round 7 (thumbhole round): Ch 3 (positioning your hook as if to bpdc) *fpdc in the next st, then ch 2. Skip the next two sts. *Work a bpdc in the next st, then a fpdc in the next st. Rpt from * to end of rd. Join with a sl st to close rd. Round 8: Ch 3 (positioning your hook as if to fpdc) *bpdc in the next st, fpdc in the next st. Work 2 dc in the thumbhole space from the previous round. *Work a bpdc in the next st, then a fpdc in the next st. Rpt from * to end of rd. Join with a sl st to close rd. Round 9: Ch 3 (positioning your hook as if to bpdc) *fpdc in the next st, bpdc in the next st. Rpt from * to end of rd. Join with a sl st to close rd. Round 10: Ch 3 (positioning your hook as if to fpdc) bpdc in the next st. Work a fpdc/bpdc decrease over the next two sts. Work a fpdc/bpdc decrease over the next two sts. *fpdc in the next st, bpdc in the next st. Rpt from * to end of rd. Join with a sl st to close rd. Round 11: Ch 3 (positioning your hook as if to bpdc to keep the "woven" look consistent) *fpdc in the next st, bpdc in the next st. Rpt from * to end of rd. Join with a sl st to close rd. Round 12: Ch 3 (positioning your hook as if to fpdc) *bpdc in the next st, fpdc in the next st. Rpt from * to end of rd. Join with a sl st to close rd. Round 13: Ch 3 (positioning your hook as if to bpdc to keep the "woven" look consistent) *fpdc in the next st, bpdc in the next st. Rpt from * to end of rd. Join with a sl st to close rd. Round 14: (positioning your hook as if to fpdc) *bpdc in the next st, fpdc in the next st. Rpt from * to end of rd. Join with a sl st to close rd. Round 15: Ch 3 (positioning your hook as if to fpdc) bpdc in the next st. *Work a fpdc/bpdc decrease over the next two sts. Rpt from * to end of rd. Join with a sl st to close rd. Cut yarn tail to about 8 inches or so and fasten off. 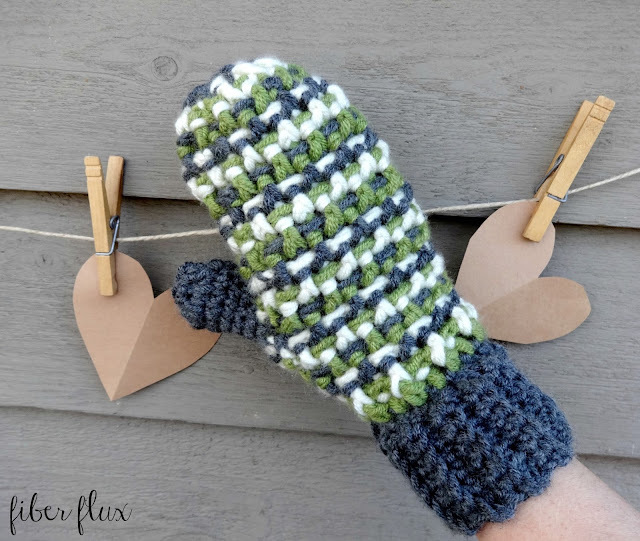 Turn mitten inside out and thread the same tail with a tapestry needle. Whip stitch top of mitten closed and pull tightly to close. Secure with a knot. 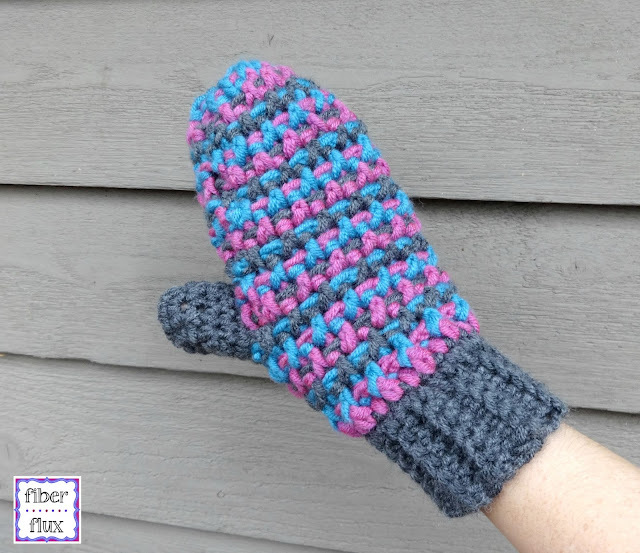 Turn mitten right side out. Round 1: work 12 sc around, join with a sl st to close. Round 2: ch 1 then work a sc in each st, join with a sl st to close. Round 6: ch 1, *sc, then sc2tog over the next two sts, rpt from * to end of rd. Cut yarn tail to about 8 inches or so and fasten off. 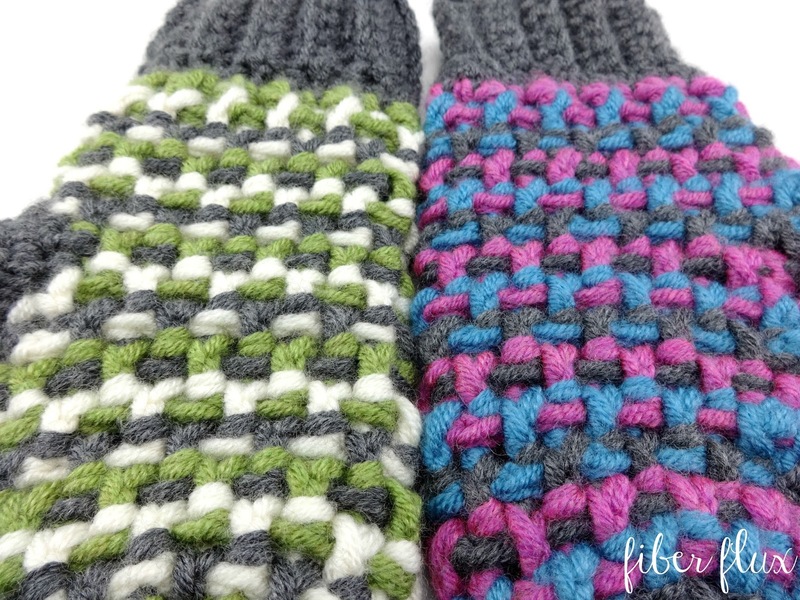 Turn mitten inside out and thread the same tail with a tapestry needle. Whip stitch top of thumb closed and pull tightly to close. Secure with a knot. Turn mitten right side out. Finishing: Weave in all ends and you're finished! The color work and texture are so cool! Love these! 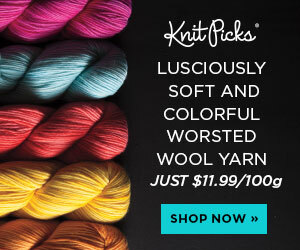 Has anyone tried this in a solid color? 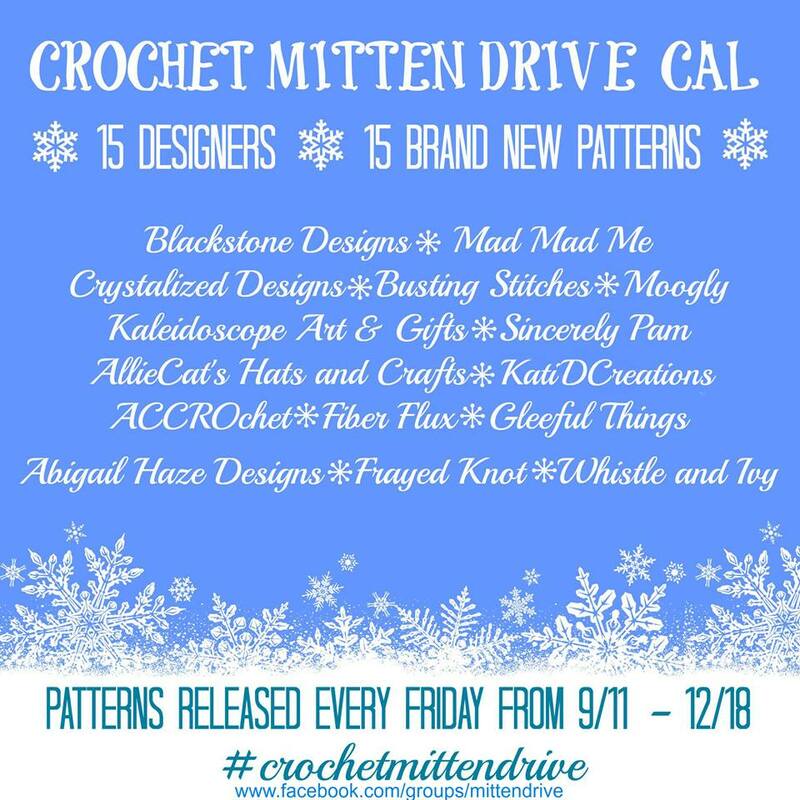 This is a beautiful pattern. Can't wait to get started on it. 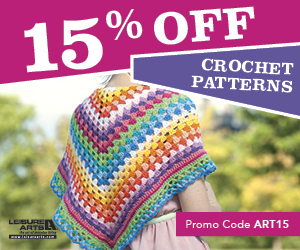 Did you use just one skein of each color? I'm planning on making two pairs, so I'm trying to determine how much to buy.